We are back in London. Lorenzo has been very busy with an assortment of family business issues. Taking Papa’s advice he is also thinking of opening a restaurant. Then he surprises me by leasing a rather splendid and perfectly placed apartment in Bury Street just below Piccadilly. It is spacious and very roomy. Since Millie is in London he asks her to help re-decorate and furnish it but it is going to take a while before it is all complete and we can have a party. I have got tickets for the theatre and as usual meet Monty and Dolly at the Criterion for drinks. We tell them all about our adventures on the Riveria and Aix-le-Bains before going to the New Oxford Theatre to see Charles B. Cochran’s production of George M. Cohan’s song and dance show Little Nellie Kelly. The elegant but rather snooty actresss, simply called June, plays the lead and the other stars are Sonnie Hale, Maidie Hope and Anita Elson. It has an interesting story, with pretty frocks, pretty faces, pretty dances, clever people and moves along at slap-dash speed. Although Eileen Idare of Idare et Cie costumed the entire show, Dolly was called in at the last minute to design several modern gowns for Anita Elson and Maidie Hope, all executed by Peron, where she is now house designer. They are exquisite. The show is a mish-mash of traditional musical comedy, a romantic drama, a good ‘spoof’ crime play and a satirical revue but dancing is one of its most important features, which suits me down to the ground. There are speciality dances from the graceful and charming Forde Sisters, Henry de Bray and Terri Storey are superb in the flirting salesman dance, Santry and Norton provide some amazing acrobatic turns and Sonnie Hale and Anita Elson feature in Dancing My Worries Away. ‘Hmm that was as clean and exhilarating as a glass of dry champagne or two’ says Monty afterward. He also reminds me that Marion Forde was an American and that I had seen her in En Douce at the Casino de Paris earlier in the year and in cabaret at Le Jardin De Ma Souer. The cuisine prides itself on its specials of chicken curry, sauté de beuf and two key dishes filet de sole tabarin and chicken a la Lombarde. The menu tonight consists of Germany (a soup made by adding yolk of egg to white consommé), Mousseline de Homard Grand Duc (Lobster mousseline), Becasse au fumer (woodcock) with Salade Japonaise, biscuit Glace aux Avelines (iced sweet brought to the table on the back of a swan cut out of a block of ice is a pretty conceit). We also partake in the 1875 brandy which is famous. We are still feeling frisky so decide to pop into the Embassy for a spot of socialising and hoofin it. As we arrive there are squeals of delight as Eva runs over and gives me a big hug. She is with Aubrey who is very chatty too. They soon run off to dance. Then Priscilla arrives with a crowd. She comes over, kisses me on both cheeks and says we should meet soon. Peggy Marsh is also here surrounding by admirers and she too comes to visit and whispers in my ear. After a lazy day we meet Priscilla and a friend called Dora at the Criterion for cocktails. They are both looking divine in gowns by Isobel Couture of Maddox Street, who they tell us is becoming very much de rigueur. Priscilla is wearing a beaded net gown with silver tissue and pink ribbon and Dora has a frock of shot blue and silver tissue with the ceinture (waist band) relieved with pearls. Later, we make our way to the Metropole Hotel in Northumberland Avenue. We go straight to the Restaurant des Ambassadeurs which has an atmosphere of sombre hotel stateliness. The roof is painted to resemble a gorgeous torquoise blue sunset with scudding golden clouds and the lights are encased in enormous pink silk flowers that glow. We dine excellently and for some reason all feast on the same thing: a Filets de Sole Calypso, one of the masterpieces of the chef M. Graillot. The filet is cooked in fish stock and Chablis along the parsley, tarragon and paprika and topped with peeled prawns. After dinner we take our seats in the ballroom. I have seen the cabaret here many times before but we thought it would be good to let Lorenzo see one of the best cabarets in town. I have forgotten to mention before that the ballroom area has been decorated by Ashley Tabb and comprises jade green pillars that sweep upwards to a great cream roof picked out in jade lace. The orchestra sit in a deep blue alcove flanked by two pale orange lamps. Extreme decorum and the austereness of unemotional Britain seem the keynote. I still love the Chinese lanterns made of hand painted silk that swing across the room and add a lovely flourish to the décor. The ‘Midnight Follies’ programme, produced by Carl Hyson, is still the same and the numbers Paradise Lane, Hawaiieen, China Love, Pinkie, Cutie, The Follies Derby, Zwadir and Gipsy Night in June are still fresh and invigorating and a pot-pourri of excellent dancing, songs, costumes, lighting and effects. Lorenzo has hired a car and a driver and we take a late afternoon drive into the country and with Priscilla and Dora visit the area around Maidenhead. We take boat rides on the Thames and have a lovely picnic which the ladies arranged. 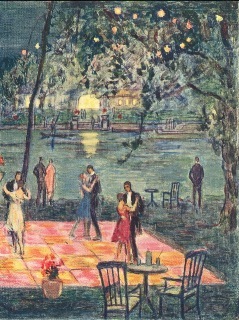 Later, when it is getting dark we head off to Murray’s River Club near Maidenhead bridge on the edge of the river. It is a magnificent old Georgian building that has been transformed into a glamorous rendevous of ragtime and romance by Jack May who owns and runs Murray’s club in Beak Street. We forgo the boat rides from a mooring at the end of the lawn and instead take cocktails outside on the lawn. Strings of fairy lanterns and little lights pop up everywhere in the flowers and trees and white coated waiters wizz about with amazing dexterity. We walk into the house and take a dance in a blue-ceilinged Japanese ballroom before taking dinner on the verandah overlooking the green sloping lawn and the river. Albert, the maitre d’hotel insinuates himself into the foreground with a pencil, dropping gentle hints which develop into our dinner. 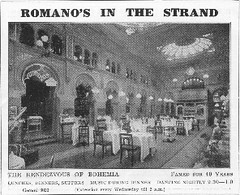 ‘I am told he was a trusted waiter on King Edward’s staff at Biarritz in 1906’ I mention. As the evening progresses the place is hopping. No surprise really since it is only a short drive from London and always attracts a lively crowd. It is also particularly popular with the theatrical contingent and we notice several stars of the stage. The dance band is wonderful and plays such delightful songs as ‘The Dancing Honeymoon’, the alluring fox trot ‘Chicago’ and ‘Come On and Dance.’ We alternate dancing in the ballroom or outside on a crystal floor open to the sky. We visit a strange place on Dora’s recommendation for a quiet night out. The Riviera Dance Club is located in splendid isolation in Grosvenor Road on the river and is a mock Roman Villa originally designed by one of the Stanleys. ‘It’s chief attraction is that it is unlike any other dance club anywhere. It has a much more refined and soothing atmosphere and is far less frenetic than West End Clubs’ Dora explains in the taxi. It is in fact a private club and Dora is a member. We have to ring the front doorbell as at a private house to gain admission. It is not a large venue but has a very chic air and the décor divine. The main dining room has oyster grey stone pillars and the dance floor is flanked by black and silver brocade walls. At dinner, the windows are open to the river and there is a luscious light breeze. One dines in peace. Later, a small band plays rather subdued music but people do dance. The words ‘awefully nice’ describe the people and the place. We have a long conversation about this ‘n’ that and both ladies quiz Lorenzo about the purchase of his apartment and his plans for the future. It is decided that when Millie has finished decorating and furnishing, the ladies will help Lorenzo arrange a welcome party. They are awfully nice. ‘What you mean is it is dull’ says Dora with a laugh. I think she might be right. We leave early and head off to dance at the Embassy.